After a full Saturday, I ask that you walk through it with us in reverse, for that is how I found the message of today that birthed the title of this blog. We ended our day at a beautiful treasure in Beirut, the Beirut National Museum. Like many museums housing artifacts of the ancient world, the treasures housed within its stone walls remind us of just how old the world is. Civilizations left markers – remembrances – that people have walked these lands for way longer than the average attention span of smart-phone-wielding 21st century folk would care to think about. We are people who live in the moment. Yesterday’s news is, well, yesterday’s news. But even as we have marked our days here on this trip with data-draining amounts of photos on those smart phones to remember, the ancients left markers as well so they would be remembered. From a Roman period tomb, these words are carved in the lid of the sarcophagus: “Theoros. Alaphatha who purchased and built [this tomb].” Clearly, Theoros and Alaphatha wanted to be remembered, and on this day some twenty centuries later, they are. In a museum, a place that stands filled with what has happened in the past, we remember: Here is a marker that is witness to the fact that Theoros and Alaphatha walked this earth in this place. 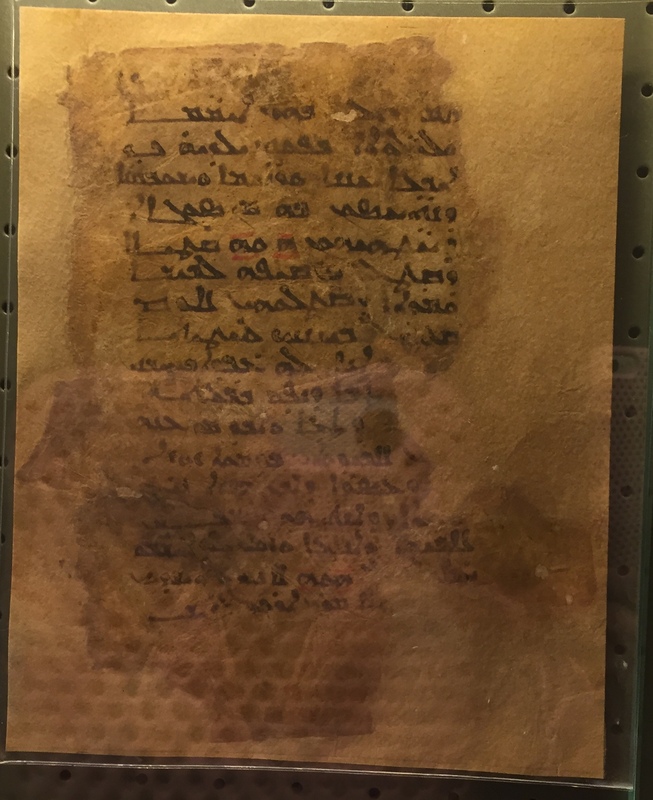 Two-sided sheet of Syriac hymns, ink on paper, Beirut National Museum. There are mummies in this museum that date to the 13th century, CE, found in a nearly inaccessible cave. 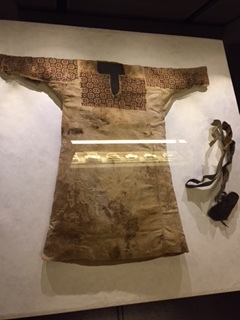 Not only the mummies themselves, but due to the climate in that area, clothing and even paper items with ink writings were preserved. There apparently was a community of people who left a nearby region due to the clashes between Crusaders and Muslims for the control of that area and settled in these caves for safety. The finding of these tombs and relics helps us to fill in a bit of history and remember them. We may not know their names like Theoros and Alaphatha, but we know they could read, they could write (hymns! ), they could sew and embroider, they sought refuge in times of crisis, and they lost children at a very young age. These things struck me as I wandered the museum because we had just come from a visit to the Our Lady Dispensary (OLD), a ministry partner that is supported by The Outreach Foundation. Founded in the 1980s during the midst of the Lebanese Civil War, it is located in a second-story apartment in a Christian area of Beirut that houses the very poor. If Jesus was walking the earth today instead of first century Palestine, this is most likely where he would have pitched his tent! In the more than thirty years since this ministry moved into this neighborhood, they have served waves of poor refugees who have knocked at their doors. Where once it was Lebanese trying to survive in the conflict that raged from 1975-1990, now it is more likely Syrians who started arriving in 2012 and Iraqis in 2014. Knock on the door and you will meet Grace Boustani, the social worker who is herself a survivor of the Lebanese war. Her family fled to Canada, but Grace felt the call to return to her homeland to serve. An angel of God if ever there was one, no one has been more aptly named. With support from ministry partners, Grace and OLD have provided relief for up to 1,000 families monthly over the past six years. 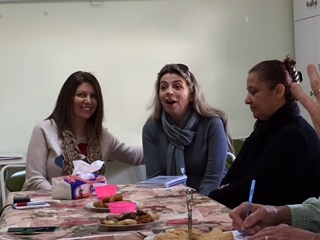 Rola al Kattar, another angel of God, serves along with Grace at OLD in providing trauma recovery programs for women and children. Today Grace and Rola introduced us to two Syrian families. Khadija from Raqqa and Aisha from Aleppo have been in this poor neighborhood for two years and one and half years respectively. Each woman has two sons. Both Muslim, they did not know each other except that one lived on the first floor of an apartment, and one lived below. The community they have formed, almost combining families really, came out of tragedy. Khadija’s then less than two-year old, Sami, got hold of a lighter and lit the crib of his baby brother on fire, burning the baby severely. As with most refugee families, there are limited resources. Fathers find only day work in Beirut. There is no health insurance. Daily bread is not assured. How would they get treatment for this severely burned child? 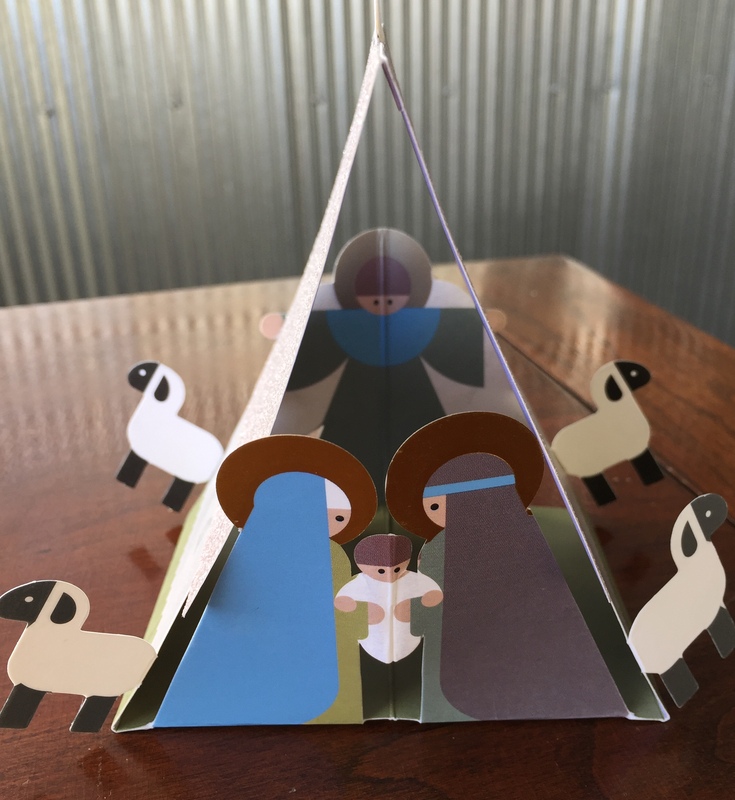 Looking at these two women who have endured so much in a world where it seems that everyone around you is only thinking of self-survival, there was a bond of community – of family – that reminded us of the empathy, the compassion, that Jesus modeled. Aisha, a woman with nothing, gave all she had to care for Khadija’s Sami. 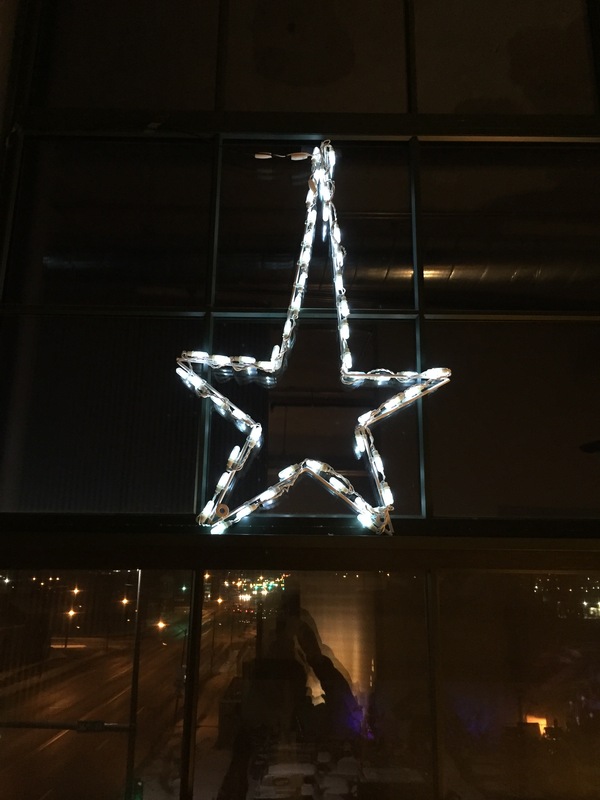 The reason we can know – and remember! – their story is because of OLD. Aisha came seeking medical help for her own sons, caring also for the son of another. When Grace heard the story, she and OLD have provided the small relief they can. In a poor community in the midst of a refugee crisis where so many need so much, OLD stands in the gap where it can to serve the Khadijas and Aishas of this world. Praise God for the faithfulness of this ministry and those who support it! 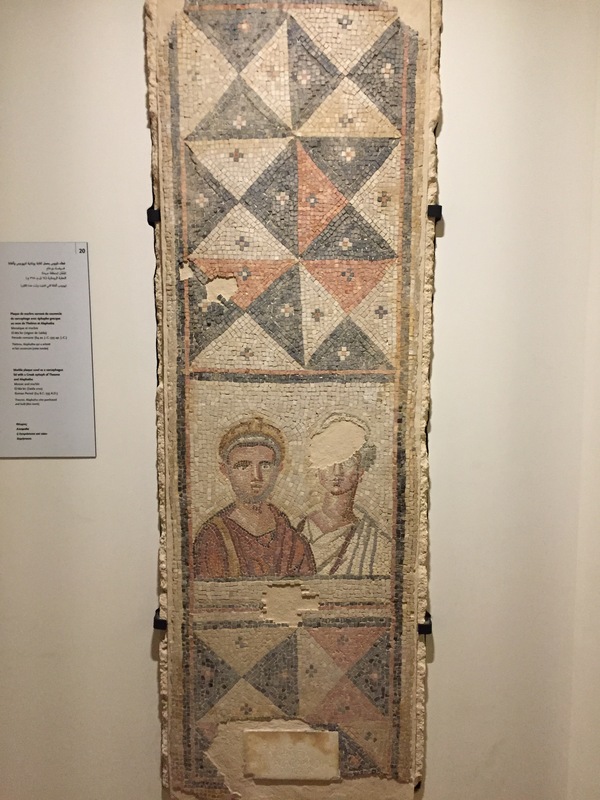 As the woman in that passage from Mark is remembered by us today for something more beautiful and sacrificial than a tombstone in a museum, Aisha’s love and the love of Grace and Rola and OLD will be remembered by the God who created them. We remember them with this story and are grateful to carry it to you. 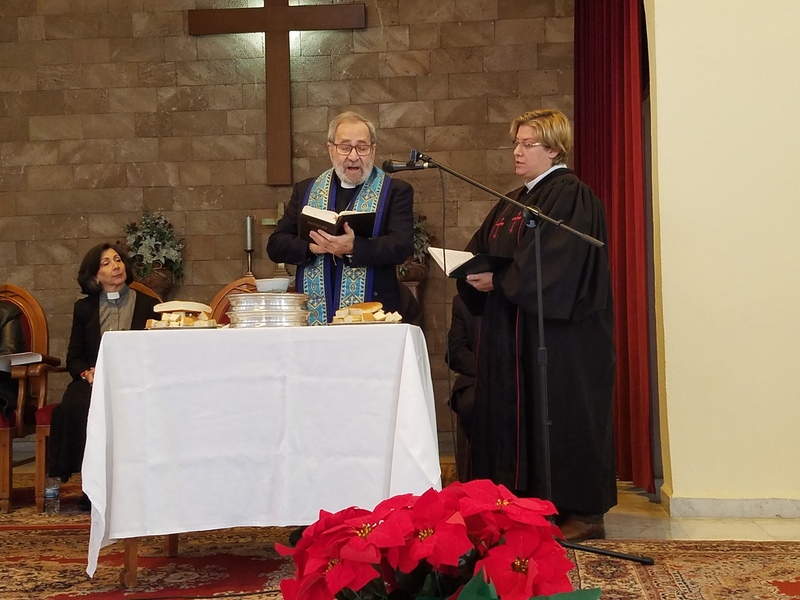 We celebrated communion this morning with the community of faith, the same community of faith that has birthed ministries like OLD and serves through the hands of people like Grace and Rola and Najla in the name of Jesus, whom we remember in the breaking of the bread and covenant of the cup. The only marker is a simple plate and plain cup, not a painted tomb in a museum. The words remind us. The community remembers. May it ever be. P.S. This is a long narrative, but I would be remiss if I didn’t tell you a bit more about Reem. She is a refugee (with her family) from the Mosul area of Iraq who has been in the neighborhood for three years. They are stuck here, refusing to return to Iraq (there is nothing to return to, all is lost there for them) and rejected for emigration by other countries. It is a difficult existence for people like Reem. Even in such difficult conditions, Reem, who was embraced with small bits of hope from OLD, now serves with OLD as a kind of right-hand to Grace. She knows and reaches out to hundreds of Iraqi families in this poor neighborhood. Grace to grace, that is the story of Reem and OLD. You asked me twice why I go to Lebanon and Syria and Iraq, and in my own ineloquent way I tried to answer. In flying off to those lands today I took a book from my shelf of unread books to accompany me on this journey. Mystics was written by Fr. William Harmless, S.J., a former theology professor at Creighton, now deceased. First of all his name is a reminder to do just that: harm less. How could I not take it to a war zone? Studying the mystics is part of my master of arts in ministry program at Creighton and I spent part of the summer and fall in the readings of Julian of Norwich, Catherine of Siena, Alice of Foligno and others including men. But I didn’t quite grasp the meaning of mysticism in the sense of Christianity until I weirdly grabbed this book at four this morning on my way out the door. After that text I emailed Wendy Wright, my theology professor who introduced me to the mystics as part of our coursework, I was so grateful! A member of the human race! To think that such a commonplace realization should suddenly seem like news that one holds the winning ticket in a cosmic sweepstakes. I have the immense joy of being man, a member of a race in which God Himself became incarnate…There are no strangers! It was on that first trip back in 2010, as I told you. We were in Aleppo, invited into the home and to the dinner table of the Aziz family, displaced to Syria from Iraq by our war. We could see the depth of pain in their manner, in their eyes, in their reduced circumstances. 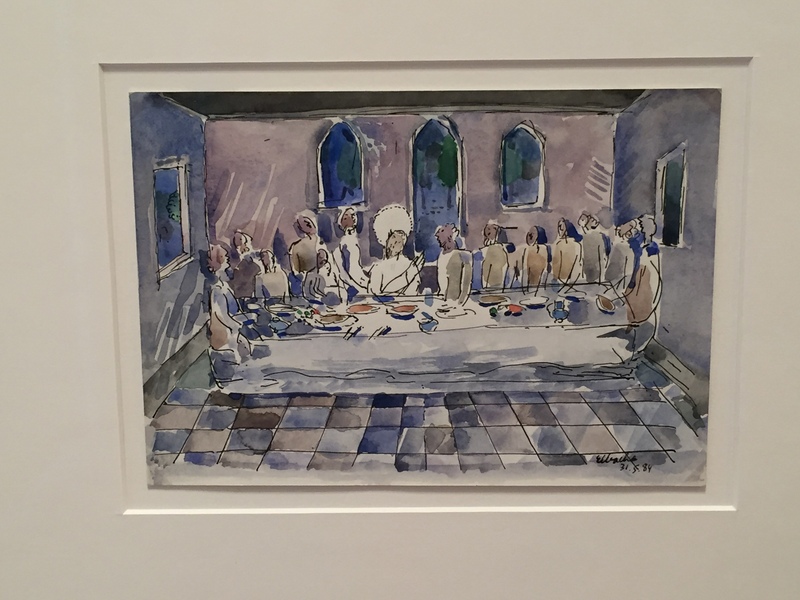 Where there should have been hatred and shunning directed at their American visitors, there was an invitation to the table, the table of grace. The Lord’s table. And that is why I go. My eyes have been opened to see the other, to see me, to see us all as we really are: Beloved children of God. Affectus. Let it affect us. It has affected me. Beirut, Lebanon, is a fascinating city. There are places we have found to visit once that draw us back again and again. One of those is the Sursock Museum. It was once the home of the Sursock family (funny how they named it after them…) and is a grand old three-story Lebanese home, now filled with modern art. 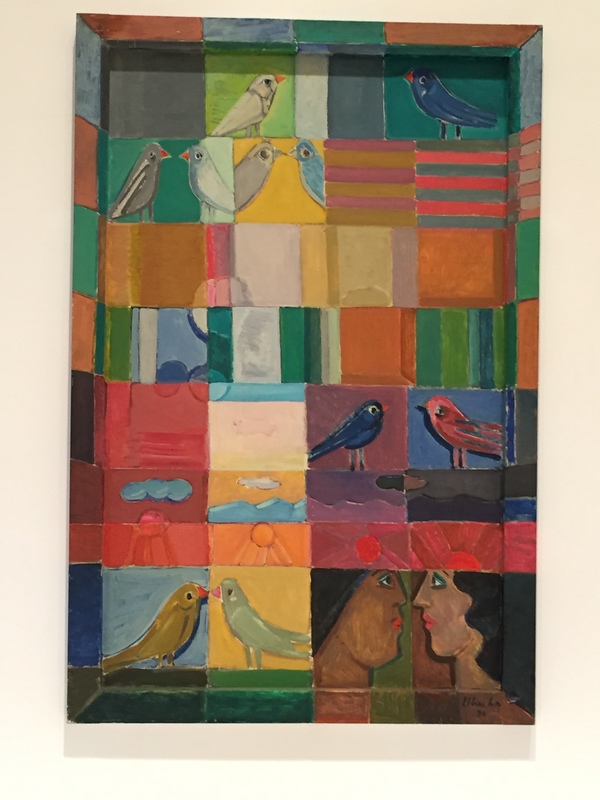 Mr. Sursock and his family were great patrons of encouraging and collecting modern art and every time we come there is a new display. This trip was no different. I have encountered two rooms that are my favorites. One usually has a great collection of old photos, much older than the rest of the art in the place. 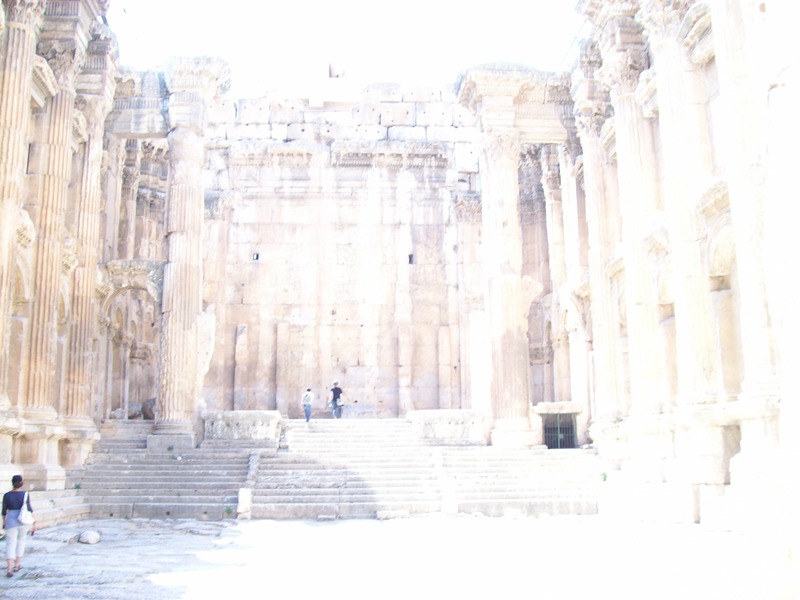 On Friday, there were late 19th and early 20th century sepia photos of Baalbek, a place I visited in 2010. The color quality of the old photos seemed to match my 2010 versions; the sun was so bright the day I was there that any color simply washed away in its brightness, sacrificed as it were in the Temple to the Sun. The other room is a beautiful old salon with benches that curve around a small fountain. You can just imagine sitting there with a good book and wiling away the hours escaping that same sun on a hot summer day. After I scanned the Baalbek photos and poked my head into the salon, I walked a bit farther down the corridor and came across this painting. It is called Encounter and it is by Amine al Bacha, the artist whose work was the feature display of the Sursock. I was entranced by the face-to-face encounters he depicted. Except for the one pair of humans, they are all birds, which I found to be kind of whimsical, as I don’t think I have ever seen birds gaze into each other’s eyes. I noticed that in some of the blocks of the painting they were farther apart and some closer together. They are even touching beaks in one block. They are encountering each other, maybe for the first time, or maybe for the second or third. And I love how the distance closes. This is how I have experienced my own encounters as I have traveled in these places. The first time in 2010, I encountered new people from a distance. 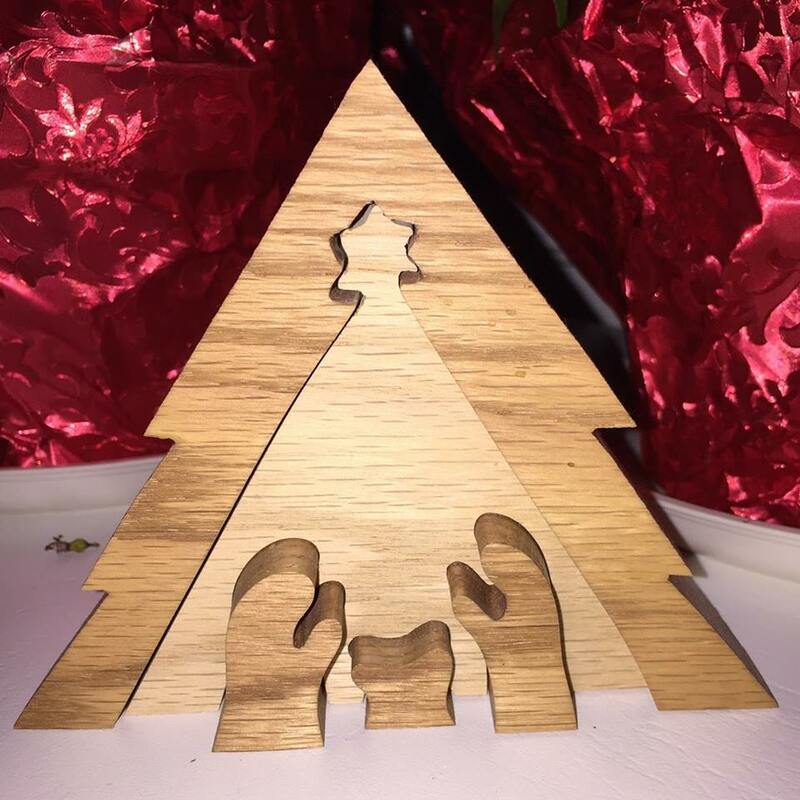 I encountered my roommate, my team members, the church people we met, first in shy conversations and then near the end in nose-to-nose embraces. We encountered each other in those spaces and drew closer to one another in deep relationships. That first roommate is now my dear friend and sister, Barbara Exley. Those team members are faithful women who have gathered me in by Facetime to pray with me over my continued travels. 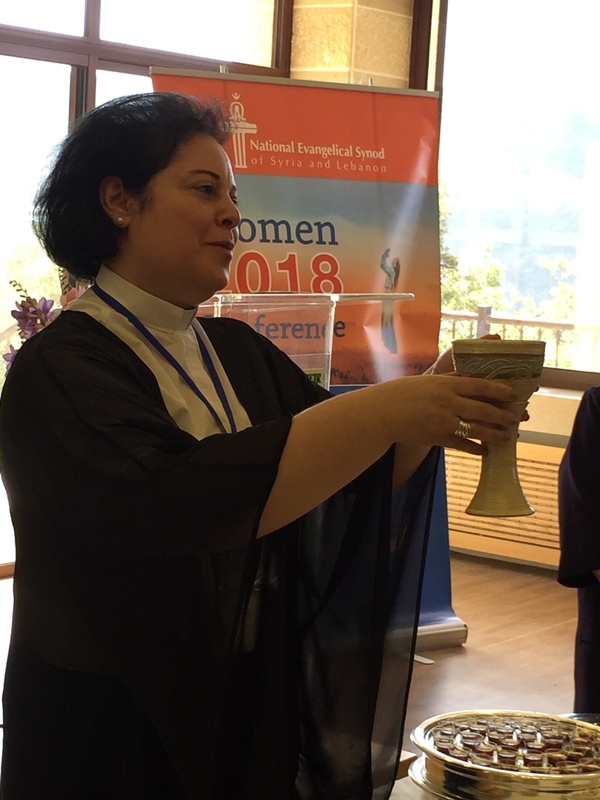 Our faithful leader and my now mentor and friend Marilyn Borst, along with The Outreach Foundation, have enabled me to encounter the churches in Lebanon, Syria and Iraq in ways that help me understand that the body of Christ is much bigger than my church in Omaha, Nebraska. In their midst, I have encountered Emmanuel – God-with-us – who closes the gap between us that our sin and failings create. 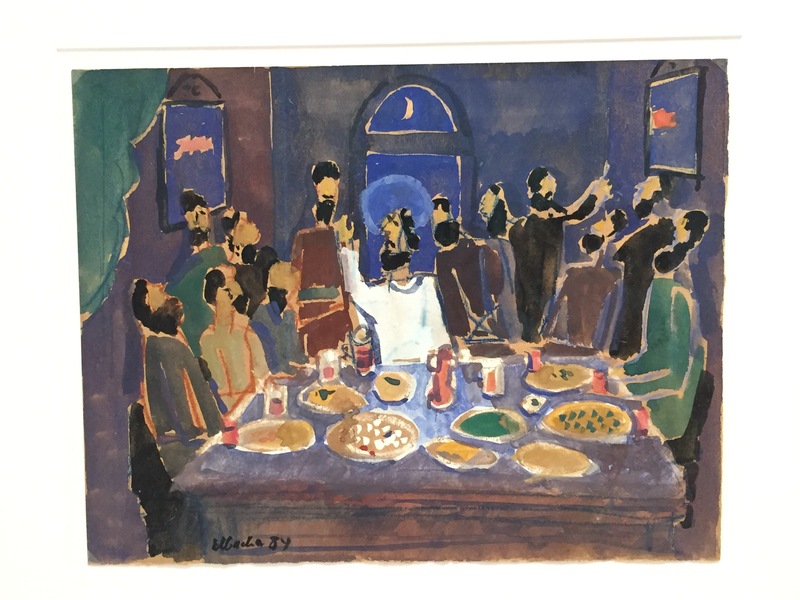 Past the painting of encounter, I discovered a series of paintings Mr. al Bacha did of the last supper, a meal we celebrate and remember every time we have communion. We encounter that same Jesus in the bread broken and the cup raised. That is the place where the gap is closed. And we all are invited to the table to encounter our brokenness and his sacrifice that forgives and heals and redeems us. It was fitting today that in Tripoli, Lebanon, we encountered him again. 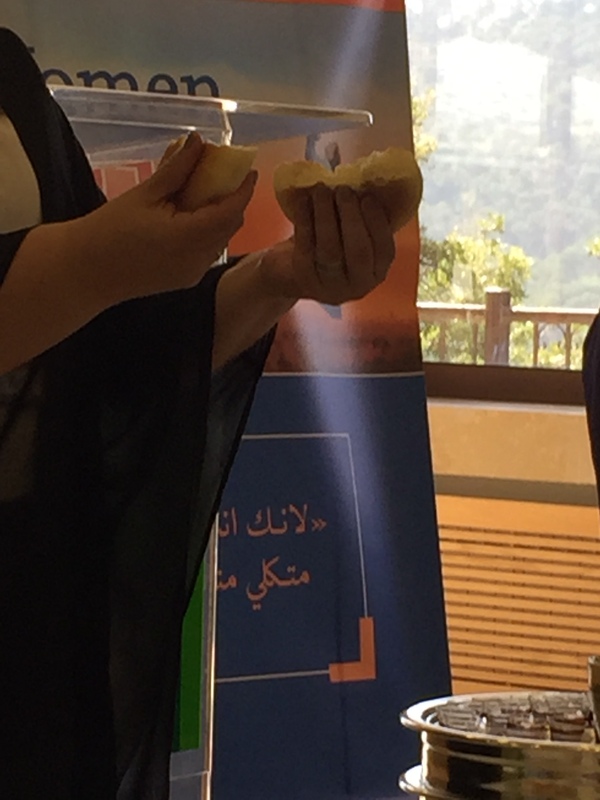 The words were in Arabic, but the breaking of the bread and the raised cup are universal. He drew us to each other as we shared the elements, and we were all drawn closer to him. Rev. Nuhad Tomeh and Rev. Rola Sleiman offer the words of institution. 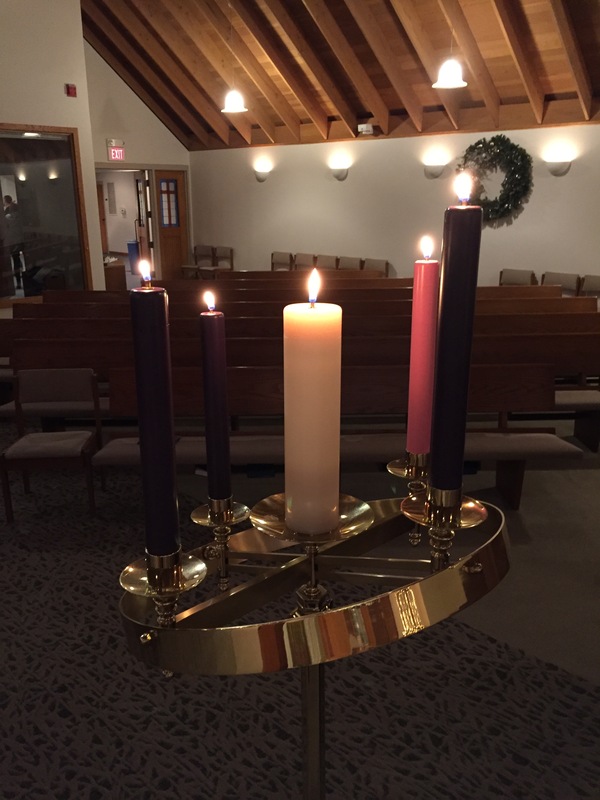 Whether for the first time, or the second, or the thirteenth, I remain grateful for these encounters and the opportunity to meet Jesus face to face. 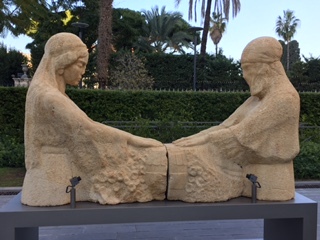 Standing outside the Nicholas Sursock Museum in Beirut is “The Weeping Women.” This sculpture depicts two women, one Christian and one Muslim, mourning together in the loss of sons to senseless wars. I find myself once again in a place that has become so close to my heart. 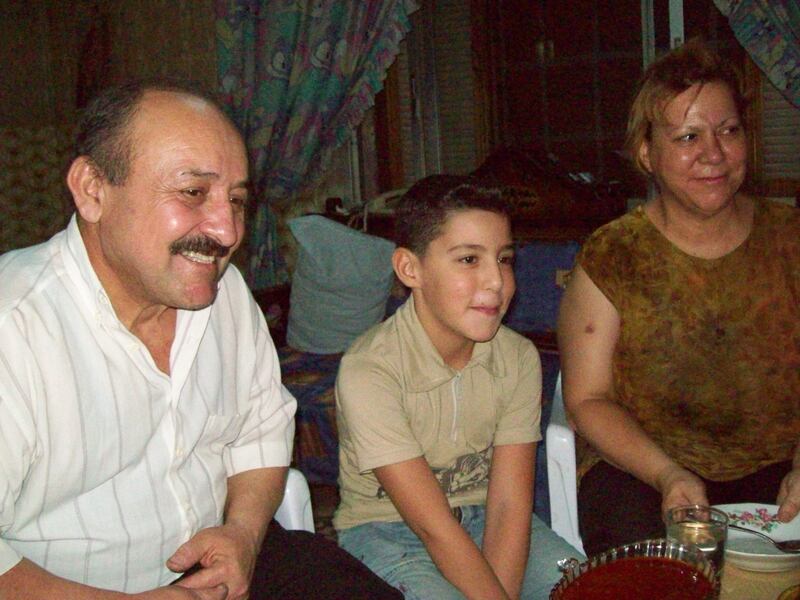 When I return to Lebanon and Syria it is like coming to a second home, and I think that is pretty amazing for someone who has lived her whole life in Omaha, Nebraska! But on a January day in this new year of 2017, I have returned to Beirut, and from here I will travel on into Syria to places I have been before in a time of peace and in this time of war. From our first appointment on Friday to our last cultural experience at the Beirut National Museum, my mind kept focusing on the contrasts. We spent the morning visiting the Our Lady Dispensary, a partner of The Outreach Foundation, a Presbyterian mission-connecting agency that I have traveled with. OLD is run by a real life angel named Grace Boustani. Well named, she exudes grace and gives glory to God for placing her right where her sweet spot is: serving in his name. 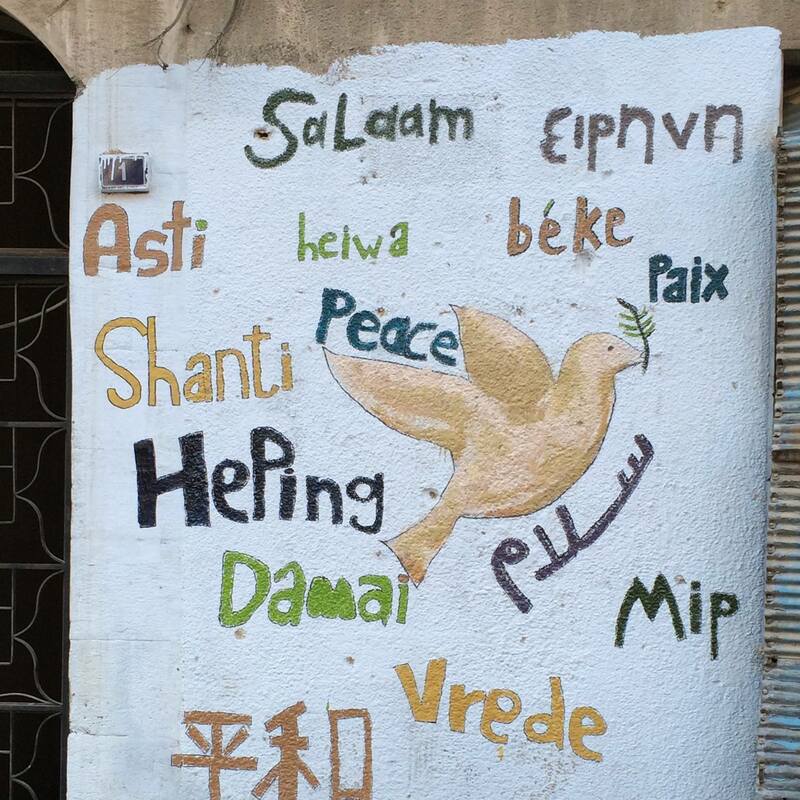 OLD provides social and medical services to thousands of refugees from Syria and Iraq who find their way to this poor mostly Christian neighborhood in Beirut. Grace herself grew up in the Lebanese civil war (1975-1990). She and her family left for a time, but she returned as a social worker to bring healing to her country. She uses that same touch with every person who walks through the door at OLD, Monday through Friday. Grace and Rula of Our Lady Dispensary in Beirut are the smiling presence for refugees of wars in Iraq and Syria. Today we had the opportunity to hear three very personal stories from three women who fled the Mosul area of Iraq in 2014 when ISIS moved in. Hala, Ramzeh and Wafa each had similar stories, but to hear them each tell their own experience was a reminder that everyone who has been affected by the happenings in the Middle East since we first invaded Iraq in 2003 has an individual story to tell. We owe it to them to hear them, see them as real people with real families. They have names! And now, we know them and can put faces to those names. They each told of fleeing in the middle of the night. “Leave now or you will be killed! Take nothing with you! Just go!” Taking nothing but the clothes on their backs, they each left with their husbands and children, walking the fifty-plus miles from Mosul to Erbil. In Erbil, they lived in a refugee camp located in the open-air courtyard of a church there. Months later, living in extreme conditions, they made their way to Beirut and the neighborhood of OLD. They told of leaving everything behind. Former neighbors sent them photos of their homes burned to the ground by ISIS. Family graves were dug up in the Mosul cemeteries and the remains of the family members were strewn around to leave no trace of their existence. Two years later, they are all trying to be resettled in other places by the UN, but the lists are long, resources few, and the list of countries willing to take refugees from Iraq and Syria is shrinking. It sounds hopeless, but at OLD they have found caring hearts and listening ears. 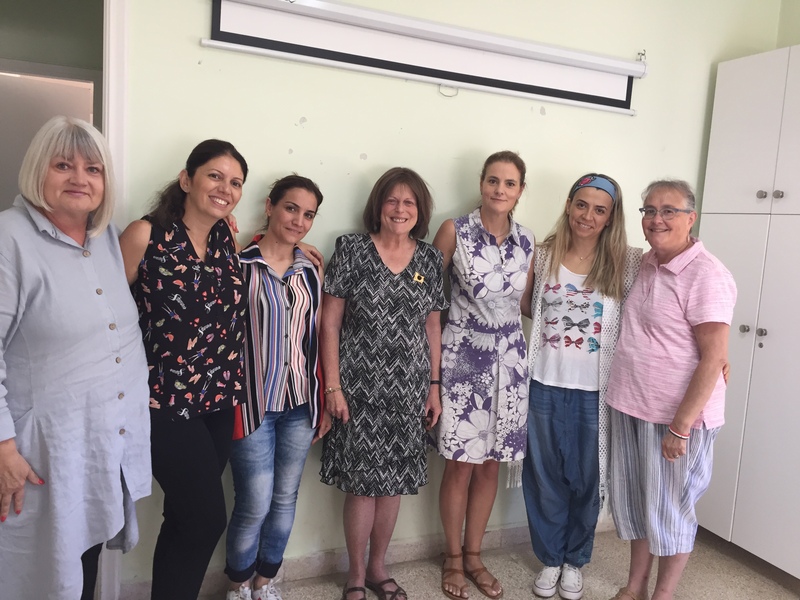 Hala, Ramzeh and Wafa have each been through the trauma healing ministry led by Roula al Kattar, and have been able to talk through their grief, forgive their trespassers, and be reminded that the God they have known all their lives is still with them. It was a humbling experience to meet these three women and share the morning with them, tears and all. The contrast came later in the day as we made our way to two museums. The first is housed in an old Beirut mansion that is filled with contemporary art. Works by people whose names are written down and celebrated are displayed in home that once was a gathering place for a wealthy family. The Sursock Museum is indeed a treasure; their belongings are well displayed and preserved, unlike the former possessions and now burned down houses of Hala, Ramzeh and Wafa. 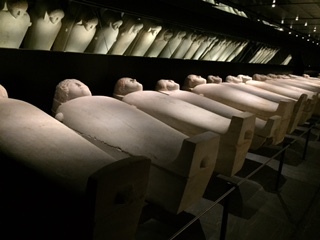 In the Beirut National Museum, well restored since the civil war, we visited the newly reopened lower level where we saw well-preserved mummies, a child’s garment from the 13th century, and a long line of beautiful sarcophagi. There were steles engraved with the names of the long dead. And yet, there were the names of someone’s ancestors. There were the preserved remains of ancient people on display for those of us walking in this century to see and marvel at. There was the evidence of lives lived in specific places. There was and will be no evidence of the life lived in Mosul by Hala, Ramzeh and Wafa, or their families. The only memory for them is what is in and on their hearts that they shared with us. And so we will be their museum, holding onto these treasures. May God grant them new lives and new homes to make new memories in the days to come. May they continue to process their grief and call on the Lord who knows all our names. May they find restoration and peace.